Unlike his predecessors who asserted themselves on coins to be “High Priest” and ethnarchs, Alexander Jannaeus proclaimed himself to be both High Priest and King. The title “King” was not allowed for Judean rulers since the days Zerubbabel. Yet on coins issued early in his reign he laid claim to both titles. After the Pharisees took serious issue with the arrogance of this Hasmonean ruler, he overstruck most of those coins, and, at the same time, minted additional coins, with the more modest titles, like his predecessors: “High Priest and (head of) the council of the Jews” (i.e., ethnarch). This act did not satisfy the Pharisees. After six years of civil war (93–87 BCE) between Alexander Jannaeus with the Sadducees against the Pharisees, he finally and severely asserted his position as King. The Pharisees had invited the Greeks to come to take Jerusalem. For this act of “treason” Alexander Jannaeus crucified 800 Pharisees in Jerusalem’s city center. 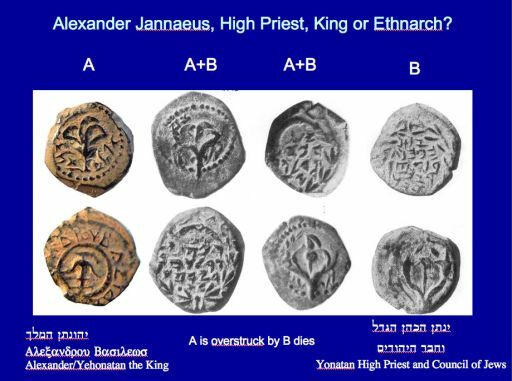 His self proclamation of kingship was again signified by minting coins with the title “King Alexander” in Greek and “Yehonatan, the king” in Hebrew. Also the symbol of the star encircled by a royal diadem (see below, right) provides two emblems of the priestly and royal Messiahs (cf. Balaam’s prophecy of the Scepter and the Star, popular symbols of the coming Messiahs during the first and second centuries BCE). 79/78 BCE: On the twenty-fifth anniversary of his rule, he minted dated coins on the Sabbatical Year. Year 25 prutot and leptas known as “widow’s mites”, by far the most abundant Jewish coin in antiquity, were minted during a sabbatical year: 79/78 BCE. In this case the star and the diadem are on opposite sides of the coin.